Perfectionism is a very personal topic that I’ve struggled with since first grade. My parents still remember the story of my teacher warning them of my perfectionist tendencies. If I got anything less than 100% on an assignment, I fell into a downward spiral of frustration, anxiety and sadness. I was a high achiever in all my school years, but was never satisfied and very hard on myself. Decades later, it’s been one of the largest challenges to overcome, but I’m happy to say I can now identify and control it. 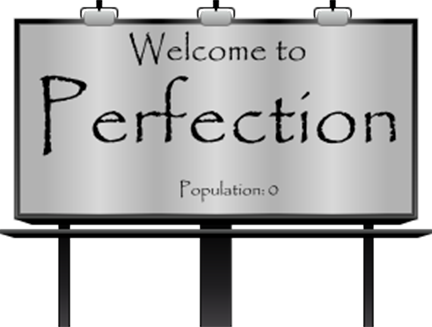 Being a prisoner to the perfection complex can leave you feeling trapped in your own world. Your constant pursuit of “perfection” can adversely make you feel unworthy, irritable and downright depressed. Sounds counter-productive, no? Shouldn’t the perfect life make you happy? Then why does the pursuit of perfection have the opposite effect for some? It’s not the pursuit, it’s the expectations you set on yourself. –the condition, state, or quality of being free or as free as possible from all flaws or defects. –the action or process of improving something until it is faultless or as faultless as possible. There’s a LARGE difference between 100% faultless and as faultless as possible. Most people define “100% flawless” as perfection, so that’s what I’ll refer to. Here are 9.6 tips and a re-framing that guided me in letting go of the impulse to be perfect every day of my life. Everyone has their definition of perfect. Since there’s over 7 billion definitions, whose standard is right? And since no human is perfect, then we’re imperfectly defining perfection! It’s deep, but true. No one, not even the most successful business person, influential spiritual leader or self-less humanitarian is perfect. We all stumble, err in judgement and fail. Unchain your mind from this toxic mindset and be glad no human is perfect. Could you imagine the world if there was? Whew, thank God for that. You will fail. It’s inevitable. If you understand this and use failures as learning experiences not a blow to your ego, you will take a closer step toward self acceptance. We were meant to screw up, but out of mistakes come the best inventions, insight and information that has changed the world. Failure is part of the success equation toward excellence. This can be tough. We’re constantly bombarded by beautiful models, millionaires with extravagant lifestyles and families who can do no wrong. If you’re striving to have a lifestyle like these folks, remember, behind the scenes, they’ve messed up too. We’ve already established no human is perfect, including everyone you see in the media. Comparing yourself to others is a quick way to forget what strengths you bring to the table. Speaking of strengths, beware of comparing your weaknesses to others’ strengths! You’ve planned everything to a tee, triple checked all details and inevitably, something outside your control happens. It happens because it can. Kids will misbehave, foul weather will come and someone will trip on the stairs in front of 700 people. Life will not unfold perfectly, but will unfold the way it’s meant to be. If you limit your urge to control everything, your mind will relax. Life can’t be controlled, only lived. This mindset has helped me the most. Have faith in God, your heart, your instinct, whatever you call it. Believe in yourself and your capabilities. Things happen for imperfect reasons, but in the end we must have faith to believe they happened for a good reason. This goes back to viewing failure as opportunity for growth and learning. Believe those imperfect moments were put in front of you to grow, not to look bad. I’m going to lose 20 pounds in 5 days! I’m going to go from janitor to Vice-President tomorrow! I’m going to run a marathon with 4 days’ worth of training! These are excellent goals, but lack perspective and a good dose of realism. I had a habit of setting myself up for failure by creating lofty goals and missing them by miles. For a perfectionist, feelings of frustration, unworthiness and insecurity quickly ensued. True goals include realistic, measurable and specific objectives. Stick to these characteristics and watch your level of success increase sans the cruddy feelings. While we’re on the topic of success (and you will succeed), don’t forget to reward yourself for an accomplishment. This sounds simple, but I still struggle with this one. Have pride when you’ve done something well, even if it wasn’t “perfect”. Look how well you organized the closet, finished that tough project or dressed for that event. You’re allowed to bask in your own awesomeness at times, it’s ok. The pressure of perfection will ease up when you congratulate yourself on a job, no matter how well done. If you don’t occasionally celebrate, even if it’s internally, you will continue having the negative mindset of: achievement = zero upside. We’re getting into the tough ones now. Perfectionists can be very hard on themselves because they’re not ‘perfect’. We’ve already established no human is perfect, so throw that expectation out the window. Without the expectation of being perfect, you’ll have an easier time forgiving yourself when you do something less than desirable. Take a deep breath, admit something went wrong, learn from it and move on. Let it go and understand you’re still only human. This makes me smile. As a recovering perfectionist, I realized one day, no one wants me to be perfect! Picture being in a relationship or a co-worker that never made a mistake. Ever. How about a leader that never made a wrong decision or prediction? That’s quite unrelatable to other folks, isn’t it? If I wrote this blog in strictly perfect and articulate grammar, wouldn’t you wonder “Does she really talk like that?”. I don’t want the 100% perfect boyfriend because I couldn’t relate to his “perfectness”. Plus, that would be downright creepy. 9.6 I encourage you to practice these principles every day. As we all know, practice makes…an ex-perfectionist! I hope these 9.6 suggestions help break your never-ending cycle of perfectionism. Instead of perfection, try pursuing excellence. It’s a much better deal and you’ll love the results.